Let’s state the obvious. Food trends are often (by definition?) ridiculous. For every bizarre flavor mashup, there’s a rainbow, galaxy or unicorn-themed Frappuccino or fast-food creation. Sometimes these concoctions are so over-the-top, we think our eyes are going to get stuck rolling back into our heads… but other times — like now — they’re downright amazing. 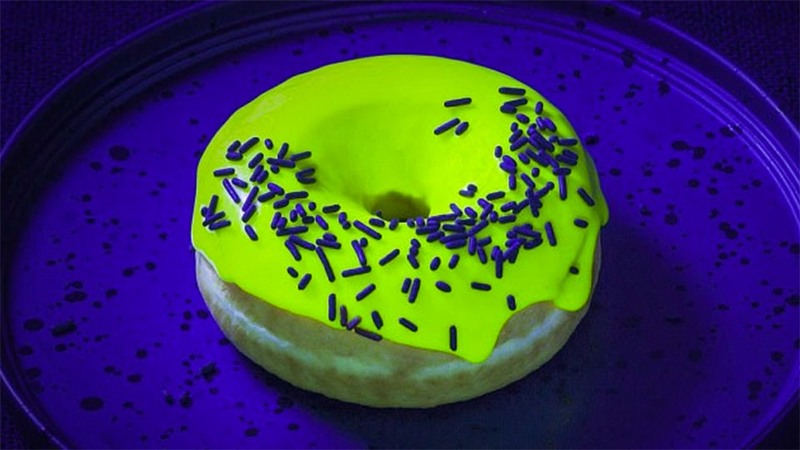 Introducing magical glow-in-the-dark doughnuts, aka “glonuts,” which were invented at Black Star Pastry in Australia and recently went viral because of the OMG-worthy photos of the out-of-this-world dessert. The craziest part about glonuts: They involve absolutely no artificial ingredients despite their otherworldly look. “We would never create anything that was unnatural, even if it was a great idea,” glonut creator and Black Star Pastry owner Christopher Thé told the Daily Mail. The icing is actually made out of something called yuzu glaze, which gets a natural glow from vitamin B, meaning we can even delude ourselves that this treat is a healthy diet option. Unfortunately, for now the glonuts are only available at Sydney’s Vivid festival at the Glow Cave Dessert Bar through June 17. But don’t be sad. While we can’t yet get these doughnuts stateside, the more viral attention they get, the likelier it seems it’s only a matter of time until someone brings Black Star’s doughnuts across the Atlantic or creates their own version here. In the meantime, you can get glow-in-the-dark cotton candy at Disney World.